Protect your computer from viruses, ransomware, phishing, spyware, dangerous websites, and more with the Kaspersky Anti-Virus 2018. Anti-Virus 2018 automatically scans your PC to find threats, including drive-by crypto-mining infections that could damage your PC's performance. This allows you to keep your PC safe without having its performance affected. The simplified security management makes it easy to keep your PC up-to-date. 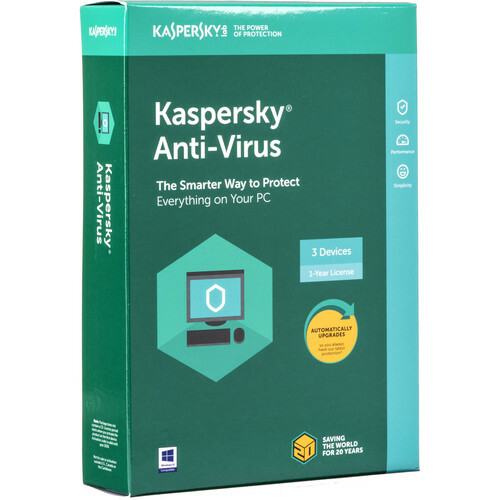 If your PC becomes infected, Anti-Virus 2018 helps you rescue and reset your computer. Box Dimensions (LxWxH) 7.6 x 5.3 x 1.7"